Synopsis: This is about Code review generally, and merely starts with Google’s way before comparing to “the enterprise”, and going into the difficulty of reviewing per se. This could be out of date as I only have context up to the end of 2008, but for the most part they only review commits that happen on the Trunk. Apart from Android, Google do Trunk-Based Development (TBD) everywhere. They made the review process as lean as they could, by making reviews ordinary and continuous. In Google’s view, Perforce’s change-lists (CLs) either have or have not been reviewed. Mondrian keeps track of those. Releases, as such, don’t have a late cycle of reviews. Indeed it feels that ‘Review’ is not an entity within Mondrian, but instead another artifact of a commit (a CL). As it is not an entity in itself, there is a 1:1 mapping of reviews to CLs. I’m laboring it now, but change-lists are the only important noun going on here. Facebook started and use Phabricator. Atlassian’s Crucible is an installable tool that works like that - assignable Reviews that can happen any time and are usually an aggregation of commits. Crucible (which I’m going to concentrate on for the remainder of this article) can review commits on any number of branches and attempts to make sense of the ancestry. Line 1 - Versus the common ancestor which said ‘cross-media’, the trunk (before the merge) has been changed to ‘sexed-up’. 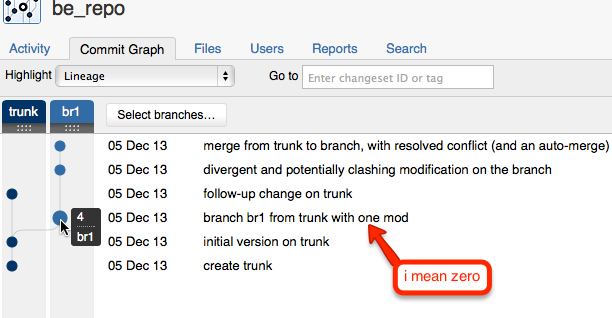 Versus the common ancestor, the branch br1 (before the merge) has been changed to ‘socially-awkward’. Both of those counted for nothing though, as we arbitrated by choosing ‘tie-dyed’ instead. Line 3 - Versus the common ancestor which had ‘clicks-and-mortar’, the trunk (before the merge) was changed to ‘empirical’ in change #5. The branch had no change versus the common ancestor. This merge shows the ‘empirical’ change as a change in #7, which technically it is (was not previously on the branch br1), but it might have been reviewed before as part of a review for #5. There’s a second parameter to the script - ‘mod’ - which causes a modification to happen to file.txt during the branch creation. The last word ‘aspects’ is changed into ‘bits and pieces’. 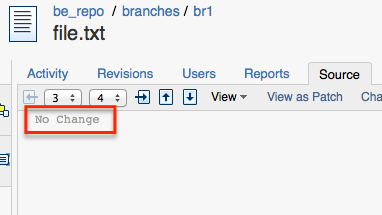 You can’t see the true change in the branch creation, because of the noise of the previously mentioned Subversion bug. Crucible has some weirdness though (at least in the present version). It does not offer me a ‘diff’ any more, from the previous version (trunk) to this one. I really want to see a diff, with ‘aspects’ changing to ‘bits and pieces’ in the last line, as the only diff presented. Those lines look like they are crossing. It’s just a display glitch in Cruicible - it’s a rhombus really. Same as Subversion. I didn’t make a script, although it would have been only 15% longer than the Subversion one due to increased command-line setup complexity. Caveats: the initial branch population in Crucible - clicking on the diff does nothing (can’t see anything). Atlassian note there are limitations in Perforce too. Actually, I’m sure a Trunk-Based Development workflow (regardless of your local-branching model), with reviews of the commits on the trunk only and ASAP is best. “Continuous Review” isn’t my coin by the way, it’s from a comment by Sam Goines, but I like it.